I woke up this morning to an email from HASTAC Scholars Director Fiona Barnett asking if I would write a blog about the incredibly generous, helpful, always useful blogs by former HASTAC Scholar Adrianne Wadewitz. I said of course. Without hesitation. It's the least I can do for this amazing human being--even though I've met her only briefly. I feel like I know her well. Inevitably her posts on the HASTAC site are featured, as is one currently, on our homepage, because she has the incredible gift of not just pushing the boundaries of "the way we teach and learn" but communicating those ways in the most eloquent, humble, generous, useful way so that others can learn from her. She is a natural leader, an inspiration to us all. Just yesterday I had said she would be the ideal former HASTAC Scholar to be nominated to the Steering Committee of our organization. Adrianne Wadewitz exemplifies the early-career professional HASTAC Scholars is designed to mentor . . . because she represents the best of academe. Adrianne Wadewitz is a model of the future we all want for our profession, for our students, for our society. It was only then reading through the rest of the morning's emails on my phone that I found the crushed earlier email from Fiona informing me that this amazing person, our wonderful Adrianne Wadewitz, had died in a climbing accident. I hadn't realized that Fiona had been asking me to perform the very sad and necessary task of writing a memorial. It does not seem possible. On behalf of our entire community, I would like to extend our deepest and most sincere sympathy to Adrianne's family and loved ones, to her friends, to her students and colleagues, to the HASTAC Scholars for whom she was such a central person and friend. On behalf of our profession, as teachers and learners together, I express our deep and enduring sadness at thei inconceivable loss of Adrianne--such a sparkling human being, such a light, such a shining example of why we become teachers and why the best teachers are always lifelong learners. She was thrilled to be the Mellon Digital Scholarship Postdoctoral Fellow in the Center for Digital Learning + Research at Occidental College this year. Per usual, she used this year of intense research to constantly communicate what she was doing. She blogged extensively on HASTAC and was a very proud former Scholar. At an early stage in her career, she had already had impact and reach: through wikipedia workshops, seminars, blogs, interviews and back-end support--often generously offered, without tribute or credit--to many, many events being hosted by others. She always was the one who pitched in. Do you know how rare a human quality that is? It should be what we exemplify first in our profession. Adrianne did. In late March, she shared the news that she had accepted a job at Whittier College in LA. Her note said, "I am going to help them develop their digital liberal arts program. I'm extremely happy! I have a job I'm going to love in a city I adore. Life doesn't get better than this." Fiona wrote in her email to me, "As a scholar and teacher, Adrianne connected wikipedia, pedagogy, feminism, participatory learning, knowledge and more in a very beautiful - and engaging - model which made room for others to jump in and start learning. She was the epitome of a HASTAC Scholar - working to allow others to see how we currently structure knowledge and access, and doing practical things to change it. I am reeling from this loss." For those who have not followed her work before, her incredible, prolific blog on HASTAC can be found here. And here is a remarkable video on Wikimedia about how to teach and learn by having students edit and add Wikipedia entries. Adrianne, we are still learning from you. Below is the formal announcement extended to her colleagues and students at Occidental College. I repeat it here for those who, like me, are just learning of this terrible loss of a great, inspiring young teacher and scholar. The Occidental College flag will fly at half-staff on Monday in her memory. HASTAC will have a moment of silence in her honor at our international conference in Lima, Peru from April 24-27. We will also dedicate an upcoming HASTAC collection and newsletter to a compilation of her blog posts, a virtual book for a woman whose presence in our lives has been real and tangible and whose memory will be lasting. Please share your gratitude and condolences here. We'd like to have a page to share with her close friends and family, to show them our respect, admiration and deep sorrow at her loss. Thank you, Dr. Wadewitz. Thank you. From teaching me the basics of Wikipedia editing and *why* it matters to summing up so beautifully what we, as educators, can learn from failure, Adrianne was an inspiration to me, as she was to so many others. Bloomington, too, is a sad place today. She wrote more than 49,000 edits to Wikipedia, and was part of many working groups to counter systemic bias, censorship and develop more pages on women, feminists and other (extremely) underrepresented groups on Wikipedia. She was #813 of ALL of the Wikipedia editors. But those numbers don't show how many of us knew her. She was an extremely avid editor herself, but she was also a community builder, an educator and mentor to us...both in terms of learning Wikipedia and in many other aspects of professional and personal life. One of my amazing memories was being in a chat room with her during #tooFEW - Because we need more Feminists Engaging Wikipedia, our project was called #tooFEW. She helped organize that event, as she did many other events, and trained us ahead of time. During the event, we were in the chatroom and one of us realized there was no page on HORTENSE SPILLERS. Hortense Spillers, people. Hortense Spillers. If you see the edit date on that page, it was created on March 17, 2013, during the #tooFEW event. Her username isn't there, but her work is visible: that page was created, it stuck, and has since been expanded. That is her mark. If you imagine how many people she taught directly in workshops, through videos, blogs, interviews and how many those of us have taught in turn, inspired and always supported by her... it's amazing. Many of us had the idea to include editing Wikipedia in many of our classrooms and she was always there to help us pick up the pieces when it inevitably got complicated or we ran up against technical issues or community regulations. But she wasn't just an incredible Wikipedia organizer and educator. She worked on children's literature, was a warm, friendly and so generous with her time and energy on many other projects. We offer our condolences to her family, dear friends and colleagues. The world needed her. You needed her. It's hard to fathom how to make sense of this loss. We will organize a project in her name here, in the near future. Perhaps an edited collection, or a forum or some other lasting memorial to recognize her. I'm off to teach my class. I almost canceled it, but we're looking at feminist digital media today, including Twitter and Wikipedia and other sites. She would want my amazing students to have this opportunity to learn about the work already being done, so I'll go in her honor, and tell them of the great loss we are all feeling. I can't think clearly right now, having just read the posts about the death of Adrianne Wadewitz. My heart simply hurts at the loss of such an inspiring young scholar, who I knew would be a inspiring collaborator in my future. I would like to activate our feminist digital networks to engage in wikipedia edit-a-thons in honor of Adrianne. Let's embrace her inspiration, put fingers on keys, and do SOMETHING to honor her impact on feminist digital culture. I will put the call out to FemTechNet and Fembot Collective. Please contact me if you are interested in helping to activate this effort. I was just saying the same thing, Anne. Let's get something organized. I'll email you! This is terrible news. I last saw Adrienne a couple of weeks ago in LA, where we had lunch and chatted about the exciting next stages of her life and career. She had so much to offer. I'm so sorry to hear of her untimely death. Even though Adrianne worked tirelessly to transform Wikipedia herself and trained many more people, each time I interacted with her online or sought her advice, she was the soul of patience although doubtlessly she'd answered all these questions too many times! She graciously and generously provided advice when I attempted my first Wikipedia entry, offered support and encouragement when I taught Wikipedia editing, and gave my work a signal boost when I blogged or tweeted about it, all this for someone she'd never met face to face! Her many many contributions to Wikipedia are one testimonial to her life, as are the countless people like me who benefited from her wisdom. There are truly #toofew like her. I offer heartfel condolences to her friends and family. Adrianne teaching at the "DOCC Summer Camp"
I am looking at a photo of Adrianne sitting on the floor of Alex Juhasz's home in July 2013, with instructors for the Distributed Open Collaborative Course (DOCC) gathered around her and her laptop. She walked us through the many things to consider in teaching with Wikipedia, clearly and fluently. She was full of ideas that could be adapted to a range of classrooms and situations, and of course answered our many questions. Later in the fall of 2013 when Fox News decided to "attack" FemTechNet and the DOCC for "injecting" feminism into Wikipedia, Adrianne was on board for the whole weekend as we figured out an appropriate response. What a loss for all of us--her contributions will continue through all that she shared. We at Whittier College--Adrianne's future colleagues--are still reeling from this news of her loss. I only knew Adrianne for a few months, but in that time her energy, her enthusiasm, her wealth of ideas, and her collegiality were apparent and exciting. I cannot say how deeply saddened I was to hear this news. I was so looking forward to working together with her for the next years! She is already sorely missed, and she had yet to formally join our community. We will honor her ideas as we move forward with our digital liberal arts program, and we would be delighted to be involved in or to contribute to an effort to celebrate her work. My thoughts are with all those who knew and loved her. I see the image of you at my house, posted by Sharon Irish, and I remember your warmth, intelligence, patience, and commitment. You were an amazing teacher and ambassador. You were a wonderful collaborator. It saddens me enormously that your next adventure has been denied you. I was so excited for you to begin your new job. I was so moved to engage with you as you made choices about your professional life. I am humbled by life's horrible logics, just as I am honored to have learned from you. I was never lucky enough to work alonside Adrianne, but her presence in southern California was palpable and transformative even if you didn't know her. She was doing brave and important work and inspiring so many to rethink the relationship between culture and technology. My thoughts and care go out to her friends and family. I'm thinking of Adrianne today, and of her parents and loved ones, and about her calm, warm energy, and her love for everything she did. I admired her even-keeled but passionate commitment to what she did, and the joy she took in her life. She was happy, which should perhaps be some solace, but also makes this news feel so cruel and unjust. 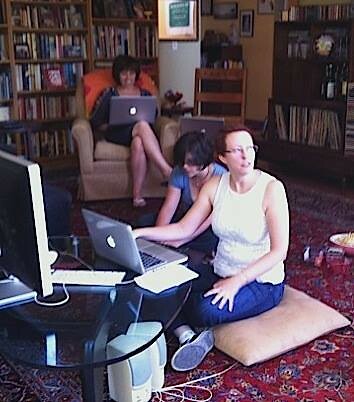 Here's where I first met Adrianne, at a feminist Wikipedia edit-a-thon. I love how happy we all look here. I only met Adrianne once, but I read her blogs here on HASTAC for years. Her work was, and remains, inspiring and important. I also know that she herself was a model of the kind of scholar, teacher, and leader that many of us aspire to be: whip-smart, passionate, brave, generous, kind. My thoughts are with her friends and family. Many of us first met Adrianne when she came to Claremont in December of 2012 to lead our “Feminist, Anti-Racist Wikipedia Edit-a-thon,” a precursor of what would become our feminist wikistorming campaign, under Adrianne’s leadership. We engaged her in her capacity as a Wikimedia Foundation Ambassador: she was to teach us how to edit Wikipedia. Little did we know that this Ambassador embodied an impressive and engaging mix of knowledge of and commitment to Wikipedia, feminist scholarship and politics, and an open, warm, and genuine public speaking style. She became one of us immediately. See the original post for more. You can also read the article from Wikinews, Wikimedian activist Adrianne Wadewitz dies. And the talk page of Adrianne's Wikipedia profile has turned into a memorial space for tributes. The memorial service for Adrianne will be held this Monday, April 14 at 11 a.m. in Herrick Chapel, on the Occidental Campus. A reception will follow at 12 noon in Dumke Commons. All are invited, of course, so please share with anyone that you think might want to stop by to celebrate Adrianne's life. Fiona has suggested I post a link here to something I published on my blog earlier this morning: http://posthegemony.wordpress.com/2014/04/14/adrianne-wadewitz/. I was very pleased also to be able to attend this morning's moving memorial service at Occidental.